In the summer of 2014, Korean manufacturer Pittasoft released a new dash cam model called BlackVue DR750LW-2CH. It is a dual channel, Wi-Fi-enabled dashboard camera with optional GPS. 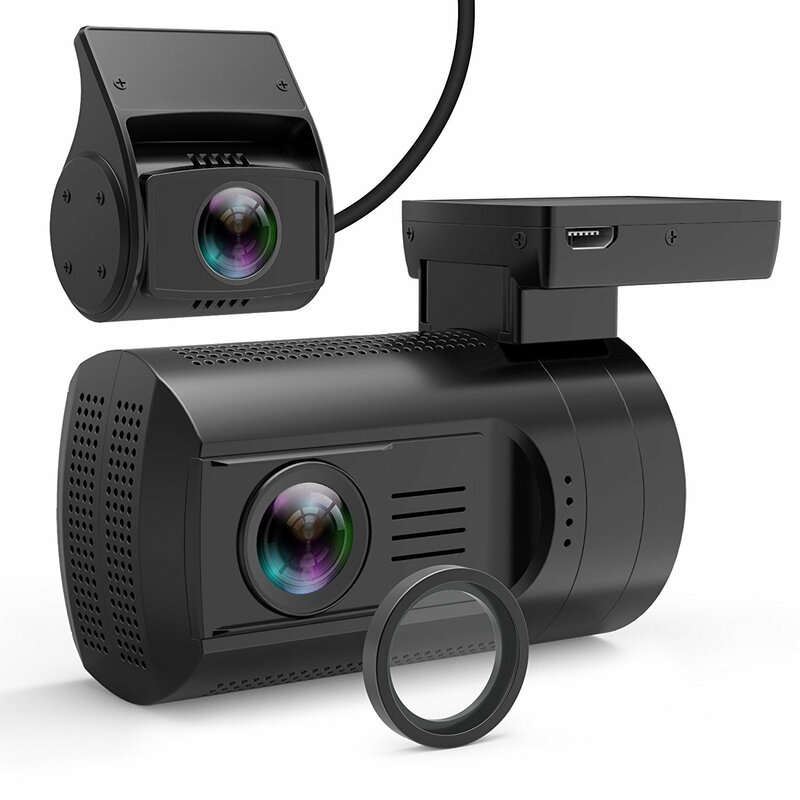 Unlike previous BlackVue models, this car camera sports a four inch touch screen that greatly increases ease of operation, plus several other interesting features previously unseen on the dash cam market. Let’s start with the basics: Both the front and the rear cameras operate at 1080p resolution, with a bit rate of 6 and 4 Mbps respectively. Typically for BlackVue cameras, the bit rate is rather on the low side. Nevertheless, the DR750LW delivers very good video quality at day and fair video quality at night time. The forward facing camera is about as big as a smart phone, with a stylish design and a matte black finish that pleases the eye while not making it too noticeable for its size. Due to the 4″ touch screen, the DR750LW is not one of the small stealthy dash cams (if discreetness is a priority for you, you may want to consider the BlackVue DR650GW instead). However, having a touch screen makes the camera much easier to set up and allows you to view your footage live on the device itself, without having to wait for the files to be transferred to your phone or laptop first. The rear camera is very small (same size as the DR550GW’s), but with an improved sensor and better video resolution. It connects to the front camera via a 6m (15ft) long coaxial cable. If you have a truck or large van, longer cables up to 15m (50ft) are also available. Switching between the front and rear video streams is easy due to the touch screen’s picture-in-picture (PIP) function, allowing you to also use the dash cam as a rear view camera for backing up — a very useful advantage over other dual channel cameras that don’t have an integrated screen. Generally speaking, the DR750LW’s graphical user interface (GUI) is quite intuitive and didn’t give us any headaches figuring out how to use it. It resembles Windows 8 in design and color choices, but you don’t have to be familiar with Windows 8 to use this dash cam. All the menu options have self-explaining icons, so you could even use it in a foreign language if necessary. Obviously, on Western markets, the dash cam comes with English menus configured by default. Some users have complained about the lack of an English manual. Manuals are available in various languages (Spanish, German, Russian, Swedish, and Norwegian) from BlackVue’s web site, however for some reason there seems to be no English version, or at least we couldn’t find it. The camera’s build quality is good. It feels solid to the touch, and the manufacturer obviously gave some thought towards an elegant design. As it is Wi-Fi capable, it manages with less cable connections than most other dash cams. You can connect your smart phone or computer to the camera just as you would to any other Wi-Fi hot spot. On the right-hand side of the unit, there are two plugs: One is for the power cable, and the other is for the coaxial cable that runs to the rear camera. On the top of the camera you have a jack for the external GPS module, which is available separately. On the left-hand side of the camera, there is a slot for a MicroSDHC card with a rotating cover that keeps dust out. Up to 64GB memory cards are supported, allowing for about 14 hours of footage. Also on the left-hand side of the unit there are three LEDs to indicate Wi-Fi, GPS, and recording activity, plus a large silver power button. This button also serves as a short cut to mute sound recording. Press it for a couple of seconds to turn the camera on or off. Obviously you won’t have to do this often: Like all dash cams, the DR750LW automatically turns on and off with the car’s ignition, so you don’t accidentally forget to record your driving. The DR750LW-2CH has most of the well-known dash cam features: auto on/off, loop recording, date/time stamp, speed display if you choose the GPS module, G-sensor, and parking mode are all there. It has Wi-Fi, so you can connect it wirelessly to your smart phone or laptop. It comes with a super capacitor instead of internal batteries, improving its resistance to heat. This camera supports buffered parking mode, meaning if a motion or an impact is detected, it will store video from 10 seconds before to 50 seconds after the event. In-built battery discharge prevention: When you are running a dash cam in parking mode for too long, it can deplete your car’s battery. To prevent this, the DR750LW monitors your battery’s voltage and switches itself off if the voltage drops below a critical value. You can configure the cutoff voltage in the menu, choosing between 11.8V, 12V, 22.8V, and 23.2V. Firmware Over The Air: The dash cam’s firmware can update itself automatically via Wi-Fi if you have the corresponding app installed on your smart phone. Apps are available free of charge for Android and iOS systems. No more hassle downloading the firmware to your computer first and following complicated update procedures. Bracket mount: Many dash cams have large clunky suction cup mounts, or stick to the windshield semi-permanently using 3M tape. The DR750LW comes with a convenient bracket mount that lets you easily remove and reinstall your dash cam for safe keeping or to use it in a second vehicle. Overheat protection: The dash cam constantly monitors its internal temperature and will turn itself off when in danger of overheating. Being one of the most expensive dash cams to date, the BlackVue DR750LW-2CH is definitely a high-end device with lots of innovative features. Usability is greatly improved in comparison to the DR550GW-2CH due to the touch screen. The one drawback, for those who value discreteness, is its size: While the rear camera is just as stealthy as the DR550GW’s, the front unit is about the size of a medium smart phone. The bracket mount makes it easy to uninstall the device for safekeeping though. To sum it up: If you’re looking for a dual-channel dash cam that can also be used as backup camera, has all the cutting edge features, and are happy with its size, then the DR750LW is certainly an interesting option. Day time front video is crisp and clear. All details are clearly visible and signs and license plates are very easy to read. Video is very clear and all events going on behind your car are captured. However, license plates are difficult to read when driving by. Good video quality, all details of what’s going on are clearly visible. Readability of license plates depends on lighting conditions. Rear view quality at night is only average. License plate readability again seems to depend on the angle of view.